Rotary Club of Hadleigh - Welcome! The Rotary Club of Hadleigh has 15 members, 8 of whom live in Hadleigh, with 2 coming from the surrounding villages of Layham and Claydon. We have five lady members, our President is Linda Humphries, another lady member lives in Great Horkesley, but her business address is in Hadleigh, and one lady member lives in East Bergholt. The other two ladies live in Hadleigh. The good news is that Rotary is changing. Attracting new members in recent years has been adversely affected by the perception that Rotary seeks a high commitment, is formal and selective in membership. This has put off many people whose lives in the 21st century do not allow the luxury of attending weekly meetings, dressing for the occasion, etc. Rotary International has at last realised that all this must change and many rules and regulations have been relaxed. Clubs now have the power to arrange their own operating structure to suit the needs of members. There is flexibility in meeting arrangements, attendance requirements and membership rules, to help attract wider interest. Members may now give just as much time as they are able, without worrying about commitment rules, etc. Our Club has changed considerably, too, and meetings are now held at lunchtime, and in Hadleigh - on the 2nd Tuesday and the 4th Thursday of each month, at The George, 12.30 for 1.00 pm. There are no formal attendance rules - just attend when able - dress requirements are completely relaxed. Membership is open to anyone who would like to be involved in a club with both a social and a charitable purpose. Help the local community - help international causes, and have fun while doing so. This is a great opportunity to help shape the future of Rotary in Hadleigh. 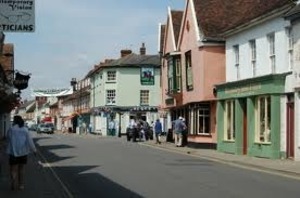 Hadleigh is one of Suffolk's finest ancient market towns, with over 250 listed buildings, a strong community and a mix of amenities including independent shops, leisure and recreational activities. Rotary International in Great Britain and Ireland (RIBI) has over 55,000 Rotarians in 1,855 clubs. It is an integral part of Rotary International, the world's first service organisation.